This page provides the latest news and updates for Club Members from Club Meetings, as well as to provide information to the Membership from the Board of Directors. Please check this page often for important updates! #From the March 2019 Club Meeting: The next JAWS class will be on Saturday, March 30th at Noon only. The Work Party held on Saturday, February 9th went well, they worked on the lights in the attic. Another Work Party was scheduled for Saturday, March 23rd at 9am to rebuild the wood target frames which the Juniors use for the outdoor matches in May and June. The new range doors are in! Thank you to everyone who helped install them! The Friends of NRA dinner went well, thank you again to the club for sponsoring the 2019 Gun of the Year! The 100% NRA Gold Level Club paperwork has been submitted and we are waiting on their response on that as well as on the grant we sent in, we have been notified that it is in the final stages of approval. We need to look into pumping the septic tank, as it's been a while since that has been done. The prices for NRA Membership have increased as of March 1st; the new prices are reflected in the green membership books which can be found in the office. The ClassLoaderPro program worked well for the Pistol Permit Class last month and Nate said that we had 100% attendance for everyone who registered, which is good! Mark Almquist's wife Shelley isn't doing well, the family has a GoFundMe page on Facebook, the link is on our club Facebook page, please consider making a donation to help them out. The next Pistol Permit Class will be Saturday, April 28th at 1pm. Dave reported that we have 113 Life Members. The Chautauqua County Federation of Sportsmen will be having their Annual Banquet on April 22nd at the Lakewood Rod & Gun. The club will be holding a NYS DEC Hunter Safety Course at 8am on Saturday, April 6th here at the club. Students can register online at the NYS DEC website through the link on our website. #From the February 2019 Club Meeting: Thank you to Dave and Boyd for replacing the toilets! The range doors have been ordered and should be in by mid-February. The Chautauqua County Friends of NRA banquet is coming up on Saturday, February 23rd at the Frewsburg Legion. Tickets for the dinner and the pre-dinner raffle are available; contact Charlie, Boyd, Floyd or Jen for more info. A motion was made by Pat Hayes for the Club to sponsor the FNRA Gun of the Year in the amount of $600. The motion was 2nd and passed. The ClassLoaderPro program is up and running and we are getting registrations in successfully for the upcoming Pistol Permit Classes. Thank you Jen for getting that all setup! Nate made up the 2019 Pistol Permit Class flyers and distributed them around the club. The State Junior M1 Garand Raffle is still going on, see Jen for tickets. Gary Babcock got the slips to clean the bill accepter on the pop machine; it's working better but still only works 50% of the time. Wayne and Gary are working on it. Wayne is still working on the club sign, he is going to fix the lettering per the membership's request and will have it by the next meeting. The next JAWS Class will be March 30th at Noon. Wayne called for a Work Party to be held on Saturday, February 9th at 9am to do work upstairs in the attic. If anyone needs a work party in, this would be a good time to go! Dave is going through the membership list so make sure you pay your dues and key fobs! Keys are getting shut off if they aren't paid ASAP! We will have new forms next year for the memberships which EVERYONE will have to fill out. We need to update the membership info in the system. Life Members will need to fill out a form and return it or they will be moved to Inactive status. We need accurate membership info for both the NRA and the Insurance Company. Tickets are also on sale for the Annual Guernsey Hollow Cemetary Resoration Project. Tickets are $10 each. #From the January 2019 Club Meeting: A discussion took place about the remaining funds in the old bank account as well as the 2018 year end finances. Wayne was not able to do anything further with the club sign yet but will soon. Jen has setup the club's PayPal account for use with the Pistol Permit Class registrations. The USA Shooting Jr. Olympics Match will be the weekend of Sat/Sun January 12th & 13th on the Indoor Range. An update was given as far as the 2 new range doors and the toilets. The cost of 2 new exterior pre-hung range doors will be $560. A motion to purchase the doors for that price was made by Gary Babcock, 2nd by Paul Mazzone and passed. The cost of 2 new toilets for the bathrooms would be $500 or less. A motion to purchase the 2 toilets for $500 or less was made, 2nd and passed. The JAWS class on January 26th was cancelled. A discussion took place regarding the By-Law change to become a 100% NRA Club which is effective as of 1/1/19, which requires all new members starting this month to also be NRA Members or join NRA at the time of joining the JRC. A discussion also took place regarding the M1 Garand Raffle for the State Junior Teams. For more info about the raffle or to buy tickets, see Wayne or Jen. A motion was made to donate $50 to the Jamestown High School Senior Party. The motion was 2nd and passed with 3 opposed. #From the December 2018 Club Meeting: The Pop Machine is working but doesn't like dollar bills so Wayne is going to try to clean the bill changer. Wayne is also working on the new sign for the club. Jen discussed the new ClassLoaderPro Program which was decided to be used starting in 2019 by the club's Pistol Permit Instructors. The fee for the class will be slightly increased to cover the fee for both the program and also for using PayPal. Doing the class every other month offset from JAWS was discussed. Larry gave the Financial Report for the Deer Shoot and Wayne said that we need to start doing a better job advertising the Deer Shoot in the future. A discussion took place regarding the club taking out a 1/2 page ad for the Chautauqua County Sports Hall of Fame as we have in the past. Larry suggested putting both Kay Anderson and Dan Feather on the ad as past recipients. A motion was made for the club to purchase the 1/2 page ad featuring both Kay and Dan for $65. The motion was 2nd and passed. Wayne brought up that at the recent Board Meeting that Pat had suggested getting 2 new range doors to cut down on the noise coming from the indoor range while it is in use. Two steel doors with a window in them to view the range were suggested. Pat will be getting a quote for the doors. Wayne would also like to see the toilets replaced; Boyd will get a quote for them as well. Dave reminded everyone about the new membership requirements which will take place as of 1/1/19. The new membership forms will be available in both the paper and online formats soon. #From the November 2018 Club Meeting: Update on the Pop Machine: We got a new compressor from the company in California, it leaked so it was sent back, we got a new one and so far it seems like it's working fine. Last month's Work Party cleaned out the back sheds and also flattened out the parking lot, thank you to everyone who helped! Nominations for Officers were reopened. Pat Hayes was nominated to run against Nate Proudman for 3 Year Director, Jen was also nominated to remain Secretary unopposed. The rules for voting were reviewed, ballots were handed out and voting took place. Dave and Charlie counted ballots and Pat will take over as the newest 3 Year Director. Congrats also to Larry Marvell for becomming our new Treasurer! Wayne went over the sign design again; he's still working on it. It was suggested to make/put up a sandwich board to advertise the upcoming Deer Shoot. Wayne asked if someone would be willing to make one. We will have a Work Party on Sat Nov 10th at 8am to setup for the Deer Shoot. 4-Position Smallbore League will start up again on Tues Nov. 6th. Wayne was approached with interest for a New Junior Class; if anyone has youth who wants to take the class let Wayne and Jen know and a class date will be scheduled. Charlie asked for people to stay and help cleanup after the completion of the Deer Shoot as many hands make light work. Dave discussed the upcoming membership renewals as we will be a 100% NRA Club starting January 1, 2019. All current JRC members who are not also NRA members will be grandfathered in by NRA so they don't have to join NRA, as long as they keep their JRC membership current. All new members after 1/1/19 must already be a member of NRA or join NRA at the time of joining the JRC. If a current member who is not also an NRA member lets their club membership lapse, when they reapply to join the JRC then they will also have to join NRA at that time. The membership forms are being redone; once Dave and Jen get them updated they will be available both on paper and on the website. Dave needs all the forms to be fully completed as he will need the info for the NRA. Also, since we will be a 100% NRA Club now, the NYSRPA requirement will be taken off the Fob form. Since Craig will be stepping back from many of the duties he ran for the Pistol Permit Classes, Wayne has a list of all Instructors who teach out of the Rifle Club and he will be meeting with them soon to discuss the future configuration of the Club's Pistol Permit Classes. Be sure to vote! #From the October 2018 Club Meeting: Unfortunately no one showed for the New Junior Class so Wayne & Jen will reschedule it for when they get more interest. A Work Party will be held on Sat Oct. 13th @ 9am to cleanup the outside in preparation for the Deer Shoot next month and to clean out the trailer. The Annual Deer Shoot will be Sun Nov. 11th and we need help that day! Tickets for the breakfast/door prizes are available to take tonight. The Pop Machine died again; Wayne & Gary Babcock will check with the company to see what can be done about it. A motion was made to donate $100 to the Busti Fire Dept for their Annual Fund Raiser. The motion was 2nd and approved. The next JAWS Class will be on Sat Nov. 24th at Noon. Dan told everyone that he will be officially retiring as Treasurer this month and he thanked everyone for their cooperation and support. Thank you Dan for all you have done for the Rifle Club! Nominations for Officers took place. Nominations for Treasurer and 3 Year Director were taken; the remaining positions were nominated to stay as-is except for Secretary, as Jen was not present to accept or decline it. We will re-open the nominations in next month's meeting. #From the September 2018 Club Meeting: Pat read the proposed ByLaw change a final time to the membership present. The vote to adopt/decline the ByLaw change was conducted and by a vote of 36-4 the ByLaw change was adopted by members. As of January 1, 2019 we will now be a 100% NRA Club. Wayne talked more about the Wall Project; it will be a slow moving, multi-year project and we did apply for a Friends of NRA Grant to finance Phase 1, which would be starting the foundation work. The layout of the wall was discussed. Wayne also went over a possible design he worked on for the new sign. He will continue to work on it and will bring an updated design for next month's meeting. The New Junior Class will be held Sat/Sun Sept. 15th & 16th from 10am-2pm. If no one shows for the class, we will reschedule it. Sporterifle will start on the 14th. Cost is $2/week and the season will be the usual 21 weeks long. Shooting will start around 6pm. Dave noticed that the brackets and snow fence which are up for hanging targets on the short range has been destroyed by shotgun shooting. He was replacing them but stopped because they keep getting destroyed. Everyone was reminded to ask others you see on the range whom you don't recognize to show their membership cards. Be sure to bring yours to show! If they say they aren't a member or say they left their card at home, tell them to go home. The next JAWS Class will be Sat Sept. 29th with two relays at 11am & 1:30pm. The next NYS Hunter Safety Class will be Sat Sept. 22nd at 8am. All students MUST bring their completed homework with them! Dan announced that after 25 years of serving as our Treasurer that he will be stepping down and will not seek re-election in November. Nominations for Officers will take place at the October meeting and elections will be in November with elected Officers starting their term then. #From the August 2018 Club Meeting: Pat has the motor for the Running Deer, he is trying to see if it can be fixed. Pat also did the final reading of the proposed ByLaw change. The vote will take place at the next meeting, which will be Monday, September 10th. Wayne and Jen will be getting together with the Monday & Wednesday Group members to work on an NRA Range Grant for the Wall Project. With the new siding, we really don't want to put up the old sign; it would suit the building better to have a newer, nicer looking sign on the building. Wayne will work on the design, perhaps a throw-back to the design Bill Seastrum made years ago. The JJRC will hold a New Junior Class the weekend of Sat/Sun September 15th & 16th from 10am to 2pm both days. The Indoor Range will be closed during the class. For questions or to register, contact Wayne or Jen Schmitt. Jen gave a report about the JJRC Juniors and NYS Jr. Team at the CMP Smallbore National Matches in July; they did very well, earning many awards and almost beat Army in the Prone Team Match! Charlie has tickets for the Federation. Legion Gun Raffle tickets were passed around, please do your best to sell them as this is a big fundraiser for our club! New York Precision will be holding it's Precision Rifle Series Finale Match at the Olean Rod & Gun Club on Saturday, September 22nd. There are a lot of cool items on the prize table for participants! If interested, visit the website for New York Precision here to register or ask Jen and she will put you in touch with Marc Diana, who runs the matches. #From the July 2018 Club Meeting: Chappy's Outdoors sent us a Thank You letter for our donation of $50. They raised $2855.00 at their benefit shoot in June. Wayne and Gary ran the transit for the wall project. Items from the Board Meeting on June 25th were addressed. It was discussed that we may possibly repair the motor for the Running Deer event at the Deer Shoot. Discussion also took place regarding getting rid of the old sign and possibly installing a new one. The proposed ByLaw change was read. Congrats to Mike Jackson, Dave Allen and Jen Schmitt on becomming National Champions in the 2018 NRA Light Rifle Sectional Match, for taking High Veteran, High Senior and 3rd Overall, respectively! The proposed ByLaw change will be read again at the next club meeting, which will take place on Monday, August 6th. #From the June 2018 Club Meeting: The old meter and service boxes are off the building. Dave hopes to have them replaced with newer boxes this summer. We are having a problem with non-members coming down to use the range without a member present. They claim that the member gave them permission to do so. Per our insurance, members must accompany their guests. Any member who sends down a guest and doesn't accompany them will have their membership suspended. The Federation steak fry fundraiser is Saturday June 9th, for tickets see Charlie. Thank you to everyone who helped at the 3P Smallbore Regional match in May! Pat read the proposed amendments to the ByLaws. Need to add in the section on Membership that NRA membership will be required for all members. Anyone who is not a member may join using our recruiting program. If NRA membership lapses, they will also lose their membership in the club. The changes will be effective as of January 1, 2019. There will be an exemption for anyone who is already a member of the club but not a NRA member as of 1/1/19, as they will be grandfathered in. The section defining a voting member of the club will also need to be amended to read that a voting member of the club will be anyone with the right to vote or hold office who is a full paid member. Family/Associate members cannot vote as they are not full members. The proposed amendments will be read again at the next meeting, which will be Monday, July 2nd at 7:30pm, so yes we will be having a meeting in July! Larry asked for the police use of the range to not be scheduled on Wednesdays. Per Boyd, it is ok for members to shoot indoors while the police are using the outdoor ranges. As far as scheduling, there isn't much we can do because that is the time that works for the departments. Wayne is recovering well from his knee surgery, he hopes to be here for the July meeting. The next outdoor match will be Sat/Sun June 16th & 17th from 9am to 3pm both days. Due to safety reasons the 50yd range will be closed during the matches so we will try to get done as soon as possible so members can use the outdoor ranges after 3pm. Volunteers are needed and will receive work party credit. There are Precision Rifle Series matches being held monthly at Olean, they are tactical move and shoot on steel style matches, like what we have here but out to 600yds. If anyone is interested see Jen for more info. #From the May 2018 Club Meeting: Further discussion about becoming a 100% NRA Club took place. In order to do so, there are requirements that the club must meet (a ByLaw change indicating the change in membership requirements; a newsletter or website; the club must be an affiliate of the State Association; the club must have an active junior program and also have a recruiter program). Since we meet all the rest of the criteria, all that is left is a ByLaw change. By being a Gold Level 100% NRA Club, we could receive $5,000 every year to use toward range/capital improvements. A proposed ByLaw change would have to be read at 3 consecutive meetings and all members must be notified by mail prior to the vote. A notice will be sent out to all members prior to the vote. The committee working on this will put together wording for the proposed ByLaw change and will present it at the next meeting. Mowing Season is here so as long as the weather is nice Dave will be planning on mowing every Friday morning until noon. There was talk about expanding the parking lot. If done, this project would be considered after the other projects (Siding, Wall) have been resolved. It would cost roughly $10,475 and we would need +/- 400' of stone and both the pine trees would need to come down. Discussion came up about improving the existing far parking lot but we would need to fix the sluse pipe anyway. There is consideration regarding putting a gate up at a later time. The next JAWS will be May 26th, volunteers are needed! At the Board Meeting held on April 30th, the Board talked with Gary Carlson and he's going to dig around the building so we can put stone around the building and also in the parking lot. A motion was made for $1,000 max to be used to do this, the motion was 2nd and passed. It was reported that the building should be sided by the end of June. #From the April 2018 Club Meeting: The Building Committee went over the bids received and recommended doing the siding but not the gutters and recommended this to the Board. At the Board Meeting held on March 26th, it was decided to go with Kurt Sturzenbecker to do the job. A motion was made to follow the decision of the Board; the Motion was 2nd and approved. The color of the siding was also decided as Ivy on the bottom and Slate on the top. Adding gutters will be decided at a later date. Dave was working on putting the LED lighting in. The possibility of becomming a 100% NRA Club was approached. A Motion was made for all new members to be NRA Members so that we could pursue the requirements of a 100% NRA Club. This process would require a ByLaw change. The discussion was tabled for a later date. At the last couple meetings the parking lot has been so full that members have been parking on the road. Please do not do this as it's a safety issue! The possibility of expanding the current parking lot will be addressed at another time. The club has received complaints from the neighbors regarding the use of tannerite. The Rifle Club had already banned its use at an earlier meeting. We may need to post a sign on the ranges; a notice will be put up on the website. The wall status will be discussed further at a later date. The Chautauqua County Federation will be doing a Steak Fry Fundraiser at the Lakewood Rod & Gun on Saturday, June 9th from Noon to 4pm, tickets are $25 each, see Charlie for tickets. #From the March 2018 Club Meeting: New range furnace was purchased and installed. It has a lifetime guarantee on the heat exchanger. Had the meeting with Chad from Jamestown Mechanical on Feb 10th regarding the wall project. Looking at 10 ft. high and cost around $12,000 for materials. Wayne did calculation for the angle from the extreme far end of the 100 yd. range to the proposed end of the wall; if were to leave 15 ft. from the back of the building there will be no way to pass a shot through from the 100 to the 50 yard range. It will be a slow moving project. Motion was made to move forward on looking into building the wall. Motion 2nd and passed, none opposed. Thank you to everyone who helped during the matches, we are officially done with the 2018 indoor match season! Dave installed an LED light above the oval table. Question arose do we want to replace all lights in the club. Would be $450 to replace all fixtures in the club room with those lights and then will put existing fixtures up in the attic with LED bulbs to make it safer and easier to see up there. Motion made to purchase 6 light fixtures, then was amended to 9. Motion was 2nd and passed, none opposed. There is also officially no longer a $10 initiation fee for new members. Dave will fix this on the paper forms and Jen will ammend it on the website. Discussed putting in the new lighting fixture in the parking lot. Wayne will discuss this more with Dave and Dawson White regarding doing this project. Will said that the Building Committee had 3 quotes plus 1 other one that wasn't ready yet regarding the siding project. The 3 quotes which were in hand were presented to the membership. The membership present voted on two topics: siding vs. painting (vote was in favor of siding, none opposed) and gutters vs. no gutters (majority voted in favor of gutters, none opposed). An official vote for which contractor and items to be completed will take place at the next meeting after we receive the last bid we're waiting on. Discussed becomming a 100% NRA club. If all members are NRA members we would get $5000 from NRA each year like Ridgway does which we could use for the improvement projects. Discussion was tabled until a later time. All program leaders need to get their 2017 attendance numbers in to Jen ASAP for the CMP Annual Report she needs to submit by April 1st. A workparty will be held on Sat April 14th at 9am to clean up the outside parking lot and the indoor range backstop, volunteers needed! Saturday April 21st will be a Hunter Ed Class here from 8am-4:30pm. All students need to register online at the DEC website and must complete the required homework and bring it with them to the class (info can be found on the Hunter Ed page). Reminder that the ranges are CLOSED during the Hunter Ed Classes! #From the February 2018 Club Meeting: The pop machine got a new compressor but is now blowing fuses. Wayne will talk with our electricians about it. Thank you everyone who helped Wayne and Jen with the Jr. Olympic and Jr. Sectional matches. The January JAWS class had 29 ladies attend which is a new record! Tickets for the upcoming Friends of NRA dinner at the end of this month are due in to Charlie no later then the 17th. Wayne has received complaints from members saying there's too much talking during the meetings so starting next month 50/50 tickets will only be sold until the meeting starts, not during the meeting. The range furnace is bad, the heat exchanger and exhaust motor are shot which presents a safety issue. Wayne got quotes for a new furnace through both Carrier and Payne. If we get the Carrier furnace, we would save $ if we pay by cash or check. Motion was made to purchase the Carrier furnace, motion was 2nd. Discussed that we may not need a thermostat which was included in the quote as we already have one on the timer. Vote: all in favor, none opposed. Discussion has taken place especially in the Wed morning group regarding building a divider wall between the 50 and 100 yard ranges. Would leave approx. 20 ft. between the building and wall for the mower to fit through. There will be a meeting on Sat February 10th at 1pm with a contractor to go over specs and answer questions. The project will cost +/- $12,000 for materials but we could apply for an NRA Range Grant to help pay for it. The project will be stretched out over a couple years to get it done along with all the other improvements we are working on. The Building Committee is looking at getting quotes to do the siding project. Any info please get it to Will ASAP so they can present the quotes to the membership at the next meeting, so the membership can vote on what we're going to do. Congrats to 3 of our Juniors for placing in the Jr. Olympics match. A medal for High J2 was presented to Junior Ben D'Angelo. #From the January 2018 Club Meeting: The pop machine is having problems, we are working on getting someone down here to fix it. For all members who got their Pistol Permit before 1/15/13 must recertify either online or via paper form before the end of this month! Key Fob payments are due, fobs will be shut off if not paid by the end of the February meeting. Dave put a shelf in both bathrooms for storing items. If anyone wishes to look at the books, let Dan know. Dave needs volunteers to help with the numerous duties he does around the club. A Jr. Olympic match will be held the weekend of Sat/Sun January 20th-21st, volunteers are needed to help Wayne and Jen run the match. If anyone is interested in helping with the Chaut Co Friends of NRA Committee, meetings are each Tuesday at 7pm at the Frewsburg Legion. The dinner will be Sat February 24th. Any questions ask Jen, Charlie or Boyd. Dan has the new NRA Membership books which have the price change. The new books are in the office. #From the December 2017 Club Meeting: The Deer Shoot did make a small profit despite a low turnout this year, thank you to all the volunteers who helped run it. Will and the Building Committee are still working on quotes. Help get the word out about upcoming Pistol Permit Classes! Dave only needs paperwork from the Life Members if anything changes. Discussion took place regarding the use of tannerite on the premises. Motion was made to ban tannerite use on JRC property, motion was 2nd and passed. #From the November 2017 Club Meeting: The Building Committee met and chose to eliminate some items from the previous quote. They are waiting on more quotes. Concerns about items being eliminated from the quotes were addressed as well as questions about water problems around the building. When there are packed meetings do not block the entrance to the far parking lot as we will need it! Don't forget to vote! Elections were held, Dave was up for re-election for the Board. Motion was made to keep the Board the same, motion was 2nd and passed. The club now has a Facebook page, be sure to check it for upcoming events and news. #From the October 2017 Club Meeting: Quotes for the building were revisited. A motion was made for a committee to be formed to get quotes during the winter months. The motion was passed, Will Ortman will Chair the committee and report back to the membership. Tickets for the upcoming Deer Shoot were passed around. The Federation will go with chicken at their next banquet, as doing the prime rib was too hard this year. Dave got a quote to do LED lighting in all the rooms. We will be hosting an NRA Level 1 Smallbore/Air Rifle Coach School on the weekend of Sat/Sun October 14th & 15th. Volunteers are needed to help clean up the club prior to this class. #Update from the Pistol Permit Instructors on 9/25/17: The Pistol Permit Class now has a Facebook page! Visit us on Facebook to keep up to date with the latest news surrounding upcoming classes! Click here to visit the group "Chautauqua County Pistol Permit Classes at Jamestown Rifle Club" or click on the link at the bottom of the Pistol Permit page and Like Us! #From the September 2017 Club Meeting: Quotes for both insulating/siding vs. painting the building were discussed. Pending further quotes, the topic was tabled until the October meeting. Remember the upcoming vote in November for a NY Constitutional Convention. The Yes/No vote will be located on the back of the ballot. Be sure to choose one as NYS will interpret no mark as a "Yes" vote. Watch the calendar for upcoming classes, leagues and Police use. Be sure to sell your raffle tickets for the Legion drawing in October! The Club makes $5/ticket sold! #From the August 2017 Club Meeting: Discussion resumed regarding the updated Bylaws. No further changes/corrections were proposed and the updated Bylaws were adopted. The application for the Federation Youth Lifetime License is on the Home page, direct as many youth to apply as possible! Wayne got a quote to do the siding for the building, including insulation. Additional quotes for both siding and painting options will be gathered and presented to the membership at the September meeting. #From the July 2017 Club Meeting: Discussion took place about the proposed Bylaw changes. Other than a few typos to be corrected, most were in agreement as to the changes. Typos will be corrected and final vote on the amended Bylaws will take place at the August Meeting. The tractor has had repairs done but is still having some problems which need to be addressed. It is strongly encouraged that everyone read the article that was in the June issue of the NYSRPA "The Bullet" magazine regarding the upcoming vote this November for a Constitutional Convention. Charlie Cardinale is selling raffle tickets for the Chautauqua Co. Federation to raise funds for the Youth Lifetime License Drawing at the end of this year. There are a lot of really nice prizes! See Charlie for details and tickets, they are $5 each or 3 for $10. The drawing will take place in December. #From the June 2017 Club Meeting: Discussed putting in LED lighting in the club and a new light fixture in the parking lot. One of the Juniors is looking to help us with the outdoor lighting project in order to earn his Eagle Scout badge. Ideas as far as lumens needed and the cost will be determined and reported back to the membership at a later date. A draft of the revised Bylaws will be available for members to look over. Discussion regarding the proposed changes to the Bylaws will take place at the July Meeting. The new Policy regarding Pistol Permit Courses held at the JRC was read and posted. As of January 2017, Pistol Permit Classes held for personal profit may no longer be held on Club Property. All proceeds from all Pistol Permit Classes must go to the JRC in accordance with the Bylaws. #From the May 2017 Club Meeting: Work on the cover/pad and Indoor Range door has begun. The Board will be meeting again later this month to finalize proposed changes to the Bylaws; an update will follow at the June club meeting. A fundraiser for Jeremy Catanese, husband of our Chaut. Co. Pistol Permit Clerk Betty Catanese, will be held at the Stockton Fire Hall on Sunday, May 21st at 2pm. All proceeds go to help the family with medical expenses incurred while he is battling cancer. Betty is one of our biggest supporters of our 2A Rights here in Chaut Co and she works hard everyday for us up in Mayville. For all she does for us, let's help her out during this difficult time! The Rifle Club will be making a donation on behalf of our membership but we are still encouraging as many of our members as possible to still please attend this event! #Update from the BoD on 4/5/17: The Work Party which was initially scheduled for Saturday April 22nd is being pushed back to Saturday, May 6th at 9am instead, so there will not be a Work Party on April 22nd. This change is reflected on both the Main page and on the calendar. #From the April 2017 Club Meeting: The doors are in and the only item left to decide was the color which they will be painted. Medium gray was decided. Please check the updated Club Calendar, as new events and times in which Law Enforcement will be using the range(s) have been added. Thank you Tim Mara for donating a new American flag for the club! Thank you everyone who came to the breakfast on April 1st to support Clayton Hanson! It is estimated that a little over 100 supporters attended the event! A note was found by Wayne on top of a full garbage can which said "I'm too full". It is felt that if you have enough time to write a note, you have enough time to empty the trash... please help keep our club clean! #From the March 2017 Club Meeting: The Bylaws haven't been updated since 2002, so the Board will be meeting this month to sit down and update the Bylaws. Helpers are needed for the Hunter Ed class on Saturday, April 8th from 8am-4:30pm. Please contact Charlie Cardinale if you can help! Also a work party will be held on Saturday April 22nd at 9am to clean up the outside. Volunteers are needed! Please bring rakes and shovels. Replacing the doors and security was also discussed. Jacketed bullets have also been reported as seen on the indoor range. 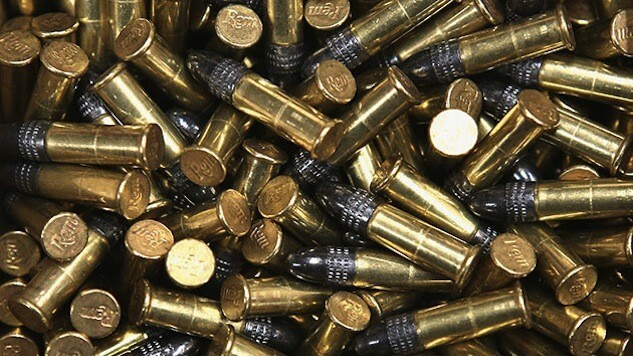 Remember, no jacketed bullets larger than .380 ACP are to be used on the indoor range! To refresh on the Range Rules, click here. #From the February 2017 Club Meeting: A Handicapped Parking sign has been put up to accomodate senior & disabled club members. Since we are a private organization the police cannot give tickets to people parked in the spot that don't have tickets up, but please do not park in the spot unless you have a handicapped parking permit. Again, this is in respect to our senior and disabled members. Also, Dave Allen is stepping down from many of the responsibilities that he had been undertaking at the club. Any and all help from members in taking over the tasks he is not doing anymore is greatly appreciated! #From the January 2017 Club Meeting: The members of the Monday morning group completed building 9 new benches for the outdoor ranges, thank you to everyone who built them! We need to advertise our club events more in the NYSRPA Bullet magazine.